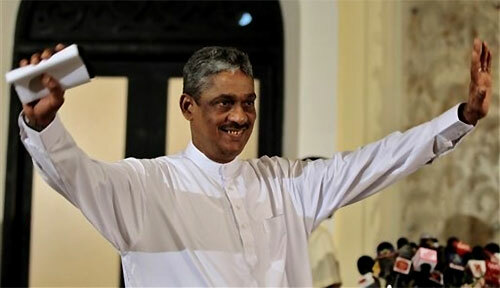 Former Army Commander Sarath Fonseka yesterday said MPs representing several political parties had already held discussions with him to work together and that anyone was free to join him. Therefore, he ruled out the possibility of joining the government at any point. “I will never join this corrupt regime, I will always stand by my principles and fight for the people and save this country” he said. Mr. Fonseka told a news conference that there was no obstacle for him to engage in active politics, and assured that he would strive towards bringing all opposition parties together in a bid to defeat this government and bring about a change in the country. However he said opposition political parties should not waste time forming alliances and electing leaders but should work together for a common goal. Stressing that some opposition MPs were not properly committed to their tasks, he vowed to strive for a genuine effort by opposition politicians to bring down the present government. Mr. Fonseka made this point by recalling that some opposition MPs kept silent when they saw shortcomings of this government. “When I question these MPs they say they have no option but to keep quiet as they obtain favours from the government MPs,’ he said recalling his parliamentary experience. Speaking for the first time at a news conference since his release, Mr. Fonseka spelt out his political manifesto that would guide him in his future politics. “The first and foremost point is to get rid of the rampant corruption and nepotism prevalent in the country and the abolishing of the executive presidency that has paved the way for dictatorial behaviour by the incumbents,” he said. Explaining his manifesto the former Army Commander insisted on the need for a complete overhaul in the political culture prevalent in the country. “The people of this country are not equal and are not served justifiably, the main reason for this is political interference. Almost all facets of this country have been completely dominated by politicians and their interference and there must be an end to this. People should have equality and justice and that is the political culture I wish to bring to this country,” he said. Mr. Fonseka also said the citizens of this country had a false notion of true democracy. “The simple fact that there is an election and people have the right to go to the polling station does not denote true democracy as claimed by many. True democracy is the right to freedom of speech, freedom to think associate and oppose which the discerning of the citizens of this country do not possess in reality” he said. He also said the 18th Amendment had paved the way for interference within the judiciary by politicians. “The citizens deserve an independent and robust judiciary but the 18th Amendment has paved the way for unwarranted political intervention, I’m a victim of this process and know first hand what people have to suffer within the prevailing system,” he said. Speaking further Fonseka said that he did not wish to see Sri Lanka facing the same fate as many other countries with corrupt regimes. “Take Germany as an example, after the Second World War the entire country was in tatters, the main rallying point of the then ruler was patriotism, he then told his citizens that patriotism was even greater than religion and ignored the teachings of religious leaders, he forgot the culture of the country and re-wrote history according to his own whims and fancies. Hitler also thrived on racism and ensured that the Nazis dominated all other religions and races. I don’t want this to happen in our country,” he said. Fonseka also reiterated that the solution to the national question could not be found in a piece of paper. “Trust needs to be built first among all nationalities within the country, it is after this trust is built that we could talk of a political solution,” he said. The former Army Commander said this was a slow and gradual process. “We cant expect this trust to take place overnight and it can be a long slow process, we have to be patient like we have been in the past until this trust is built and a solution is put forth,” he said. The Army Commander also said that he was choosing this path against the regime shunning all the wealth and privileges he stood to receive. “I don’t want money, I could have had money and privileges if I didn’t join democratic politics. I had to pay with two and a half years in Prison because I joined democratic politics. I didn’t choose that path and will continue to serve my motherland and my people. I risk having to go to jail again and this doesn’t frighten me, I will fight bravely for my country and my people,” he said. Mr. Fonseka said there were no hidden conditions involved in his release from prison. Therefore he said he would engage in winning the right to contest an election and regain voting rights, the same way he faced the challenge of getting out of prison. Also, he charged that the manipulation of law by the rulers of this country had barred him from contesting and voting at elections for seven years. Referring to the allegation that he was out of the country during the final stages of the war, he said he was actively directing the forces from China during the last stages of the war. He said the forces were able to save 85,000 civilians from senior LTTE leaders including Prabhakaran during the last few hours of the battle. Besides he said the fearful battles raged right throughout his two and a half year tenure as Army Commander. He thanked MPs Karu Jayasuriya, Palitha Range Bandara, Palitha Thewarapperuma, Jayantha Ketagoda and others who were with him during his time of difficulty. When asked by a journalist about his views on foreign policy, Mr. Fonseka said that his policy was firmly rooted in non- alignment. “I believe in a non- aligned policy, India is our friend and neighbour and that relationship must be preserved at any cost. China, too, is a friend and has helped Sri Lanka. We must also learn from the western system in which internal democracy is robust,” he said. He said that our country had a system whereby the executive could manipulate things to ensure that a feared opponent could not contest him. “The law is such that anyone who serves more than six months in jail can’t contest an election for seven years. This means that anyone who is feared by the executive could be framed and put behind bars. And the executive won’t have to face the person -who would be in the political wilderness. This is exactly what has happened to me” he said.